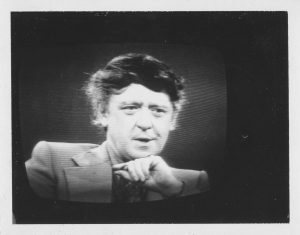 Despite his literary persona, Anthony Burgess did not think the world of television below him. Not only was Burgess a television reviewer for The Listener, for which he wrote weekly columns between 1963 and 1968, but he also produced scripts for television throughout much of his career. Most notably, he was employed by Lew Grade to write the script for Jesus of Nazareth (1977), the mini series directed by Franco Zeffirelli. This was preceded by the script for another Biblical epic, Moses the Lawgiver (1974), starring Burt Lancaster. Burgess’s writing for television began with the BBC teleplay By the Waters of Leman, a short drama about Byron and Shelley in Geneva. It was broadcast in November 1966 and Burgess subsequently fictionalised its production in Beard’s Roman Women (1976). He wrote for television until the mid-1980s, when he produced the script for A.D. Anno Domini (1985). This article, originally written for Corriere della Sera in 1986, details Burgess’s not altogether happy experience of judging the 24th International Television Festival of Monte Carlo. It’s an experience he describes as ‘like a prolonged convalescence in which you were forced to waste your time looking at the idiot’s lantern’.